We have 20 years of float, peirs, runway(gangway) construction and maintence experience. Bud Gallagher the owner of Float Works Inc. has been in the construction field for most of his life. He knowledge of build construction and fabrication provides his team with the invaluable resource to tackle nearly any task. Appointed harbor master for westport Island maine in 2003 he has managed the surrounding waters and is very firmiliar with all permitting needs. Float Work was established in 2002 to provide marine construction and maintenace services for lincoln and sagadahoc counries and beyond. Focusing primary on ocean and river access. 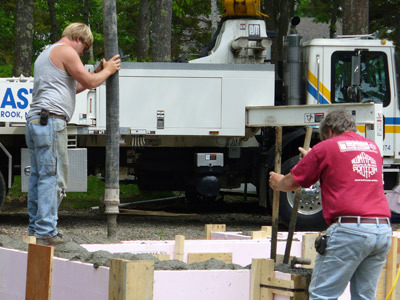 Lake and pond access are also services that float Works provides. We have built and delivered our product as far south as Cape Code and as far north as bar harbor. Feel free to contact us about any of your water access needs. Some towns in our service area include: Westport Island, Edgcomb, Wiscasset, Bath, Brunswick, Phipsburg, Georgetown, Boothbay, Round Pond, Portland, Freeport, Five Islands, South port, Alna, Damrascota, Bristol, Woolwich, and inland lake river and pond access.